Do you remember your first fragrance love? I do ... and it was Lancôme Trésor. While some may argue that this fragrance is a bit too "old," I absolutely love it. The combination of apricot blossom, rose, lilac, iris, peach, amber, sandalwood, musk and vanilla notes creates such a sensual experience that, even as a teenager, really spoke to me. As I've grown up, I've actually chosen some decidedly less mature fragrances than I did in my youth. 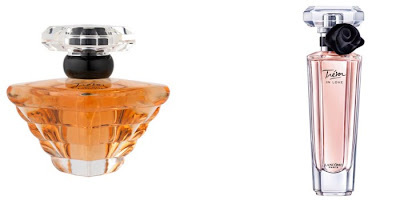 And now there's Trésor in Love -- a youthful, flirty fragrance with notes of nectarine accord, pear, bergamot, Turkish rose essence, jasmine, cedar wood and musk. It's lively and fresh but still has a sensual feel, thanks to the musky undertones. From the diamond-shaped Trésor to the elongated cut glass bottle of its younger counterpart, each bottle is absolutely gorgeous. I'm so happy to have each one sitting atop my vanity, giving me the choice of how grown up -- or not! -- I want to feel. Lancôme Trésor retails for $75 at sephora.com. Lancôme Trésor in Love retails for $47 at lancome.com.